Tokyo (AFP) – A Japanese soldier was killed Tuesday and several other people injured after a volcano erupted near a popular ski resort, sparking an avalanche and leaving scores stranded — including tourists from Britain and Taiwan. 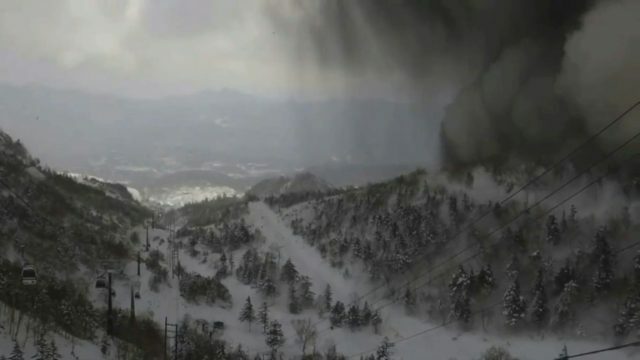 Footage broadcast on Japanese television showed thick black smoke interspersed with falling rocks rolling down the snow-covered side of the volcano towards a ski slope. Defence Minister Itsunori Onodera told reporters that one of eight members of the Self Defence Forces who had been on a training mission on Mt. Kusatsu Shirane, northwest of Tokyo, had died after being hit by volcanic rocks. “His lungs were damaged” because of the impact of the rocks, Onodera said, adding that the other seven soldiers had sustained injuries. The defence ministry had initially said a total of six infantry troops were caught up in the incident. Around 80 people were stranded for hours at a gondola station at the top of the mountain after a power outage. Television footage showed military helicopters buzzing overhead as people were airlifted to safety. The area had seen heavy snowfall in the hours leading up to the eruption, making the slopes ripe for avalanches. A snowboarder told NHK his gondola had stopped suddenly and he saw that other gondolas around him had broken windows and were covered in ash. “I realised it was an eruption. Forty to 50 minutes later, all the gondolas moved up to the station on the top of the mountain,” he said. Agency official Makoto Saito told reporters the volcano could still spew more rocks and ash, and that there was a risk of further avalanches. A local fire department official told AFP that 10 people had been hurt in the incident. Among the injured were four people hurt by shattered glass while on a ropeway gondola at the ski resort. On September 27, 2014, Japan suffered its deadliest eruption in almost 90 years when Mt Ontake, in central Nagano prefecture, burst unexpectedly to life. An estimated 63 people were killed in the shock eruption, which occurred as the peak was packed with hikers out to see the region’s spectacular autumn colours. According to the Meteorological Agency, this was the first time Mt. Kusatsu Shirane has erupted since 1983.